For as many access ramps there are in the area, there are still some connections missing. Hopkins International Airport is going through an expansion, which includes a shift of Brookpark Road (SR 17). Just like on I-670 Eastbound approaching I-71 in Columbus (see the I-670 portion of the Columbus Virtual Roadtrip), through traffic must "exit" to the right while traffic going straight leaves I-71. 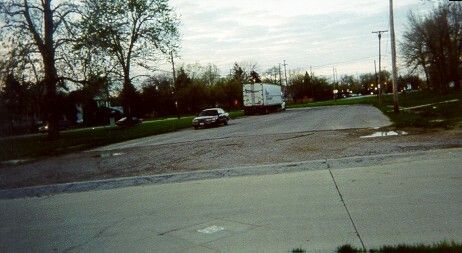 When I-71 branches to the south from the Airport freeway, it must immediately cross train tracks (freight and RTA) which it had been paralleling. A ramp from I-480 Eastbound joins I-71 Southbound directly above the tracks. The roadway on the bridge with the construction signs is I-71 Southbound, the one off to the left is I-71 Northbound, and a few supports for the 480E-to-71S ramp bridge may be seen in the center background. Originally Ohio 237 runs where it does now north of the airport and I-480, but for a time it ran just to the east to connect directly to today's Airport Freeway, complete with a cloverleaf at Ohio 17/Brookpark Road. 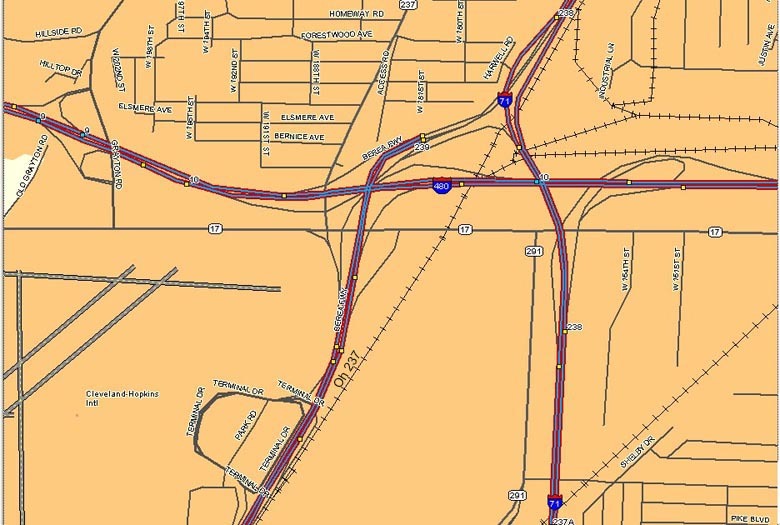 When the current interchange configuration was built to accomodate both I-71 and I-480 (see map link above), Ohio 237 was shifted back west. A short stretch of the interim 237 remains, used now for parking for area industries. Also in the area appears to be a demolished neighborhood, with streets and power lines still extant. Current 237 is in the background. 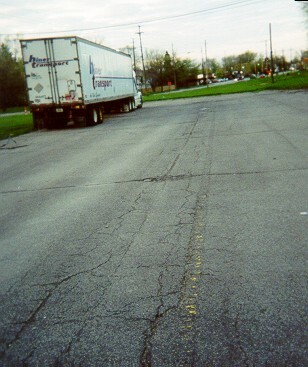 Note the faded pavement markings. This area does not align with the stretch above, but it does appear that a road was once here. In the background are ramps for the I-480/Airport Freeway section of the interchange complex. The overhead guide signs at Hopkins Airport are standard except for being red instead of green. 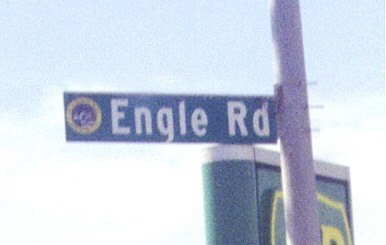 Note: By August 30, 2002, these signs had been replaced by non-standard light blue signage, some with green inlays where route markers are used. Certain traffic lights are made so that their indications may only be seen when looked at directly, like these at the entrance to Hopkins. They are used where traffic might think signals are for them when they're not, like when roads meet at a shallow angle. Notice that the red indications in the middle pair are barely visible, and those of the leftmost pair are even less. There is a new version of this type of signal which more closely resembles a conventional traffic light (I even know of an intersection which uses both the older and newer versions of the signal). In the background are more red overhead signs. Link to Topo Map of area and Case Western webpage about Cleveland Hopkins International Airport. The arrow signal heads where the I-71 Southbound ramps meet West 154th Street (connection to West 150th Street) look like reused lane control signals. 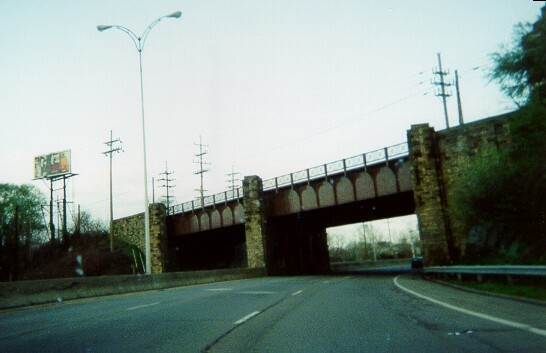 This overpass, between Edgewater Park and the West 45th/49th Street exits, is one of several contemporary features on the West Shoreway (here US 6 and 20 as well as Ohio 2) which is one of the area's oldest highways. This is at a feature identified in traffic reports as the "Westinghouse Curve". Crocker Road forms somewhat of a west bypass of Metro Cleveland (there are plans to build a more formal bypass in its corridor -- see this article). 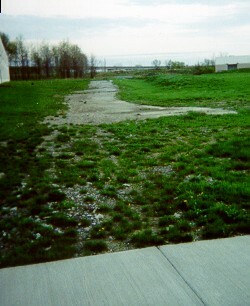 Bassett Road is actually severed by I-90 right where the photo was taken; to the north, it curves just west and takes over the path of Crocker Road to US 6 and Lake Erie.